This product is sold as a concentrate that makes 5-gallons of rinse. Concentrate allows for cost-effective shipping and the savings is passed on to you. Commercial Dishwasher Rinse for use in both high and low temperature machines. Completes the end washing cycle and removes water spots and residue leaving dishes sparkling. Contains wetting agents and surfactants that speed up the drying process. 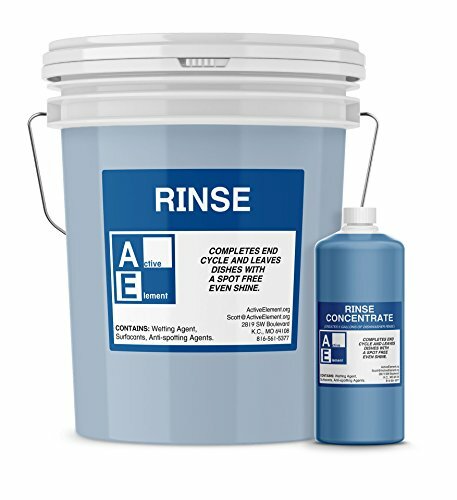 Commercial-Grade rinse for use in both high and low temperature commercial machines. Completes the end cycle of industrial dishwasher machine. Completes the end cycle and removes water spots and residue leaving dishes and glasses with an even shine. Powerful cleaning meets cost effective plus free nationwide shipping.